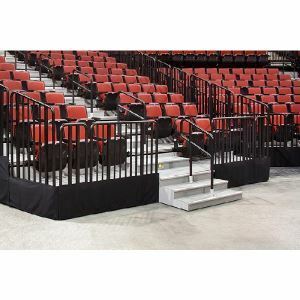 A perfect temporary stair option for access to the main event floor. When general access to the main floor is required, StageRight’s Portable Event Access Stairs are the solution. When general access to the main floor is required, StageRight’s Portable Event Access Stairs are the solution. StageRight’s Portable Event Access Stairs are modified to fit your specific needs and application and host a wide variety of options. Provide code compliant access to field level/main floor ingress/egress routes.